**Disclosure: We received complimentary admission for the purpose of conducting an accurate review. No compensation was received. All opinions are 100% my own. 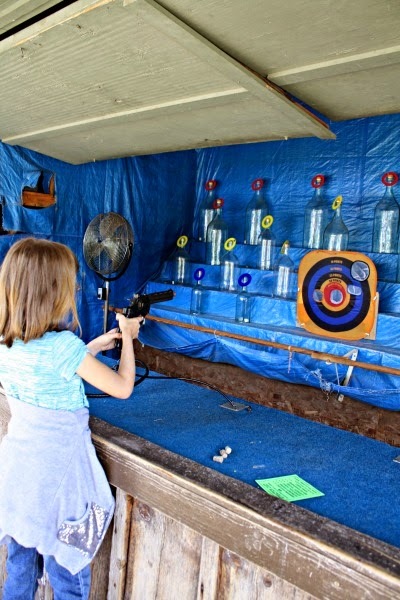 Dust off your boots and grab your cowboy hats and holsters, Donley's Wild West Town is a fun way for parents to enjoy the sights, sounds and experiences of the Wild West with their little ones. 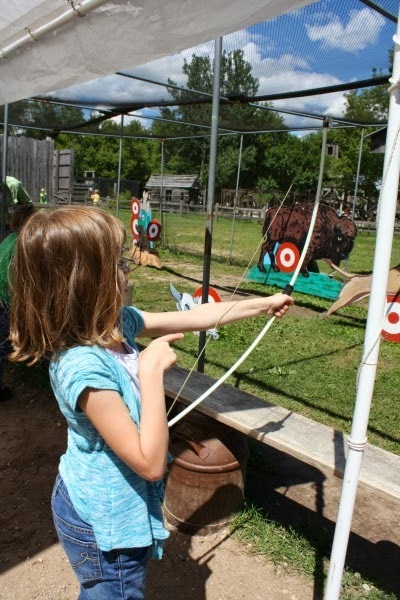 Wild West Town really exemplifies childhood fun by grabbing your imagination and transporting you to another place while encouraging hands-on activity. You first enter the park through the museum and gift shop. 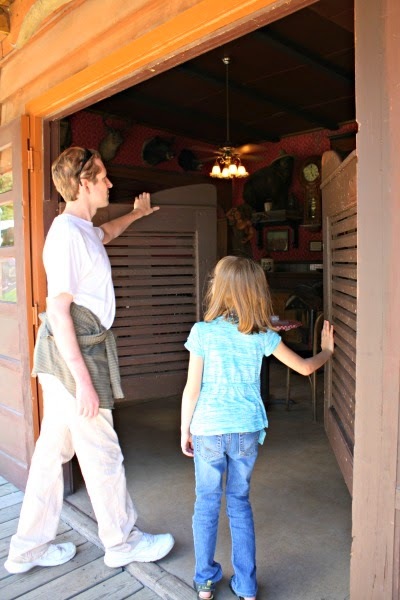 Once you open the door to the park, you are greeted by a Wild West Town, a corral to lasso "cattle," a lively carousel and plenty of space to move around! Yes, space--the entire time we were at Wild West Town we felt that we had space to move around which is definitely welcome when visiting with little ones. My daughter was so excited when we first entered the park that it was difficult for her to choose what to do first. I encouraged her to do a once over before settling on something to do. She immediately honed in on the 'Panning for Gold' operation but we opted to try some other activities first. Cork guns, bow and arrows, slingshots and more hands-on activities were really engaging while giving the flavor of the Old West. Pony rides added to the fun! Look at all of this old school fun! My daughter loved trying to perfect her abilities at each station. Additionally, she loved receiving strategy advice from her Dad--special family moments! 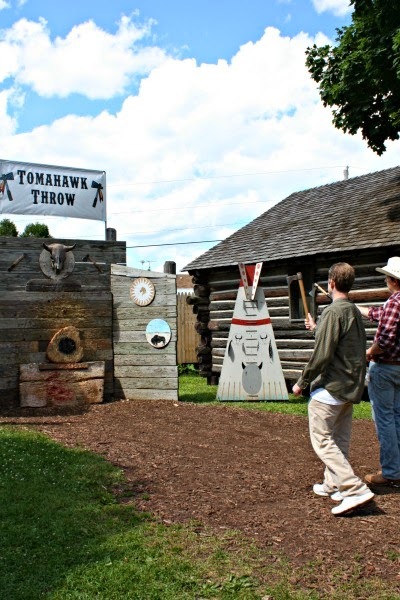 Wild West Town also had some special fun for the parents--tomahawk throwing. Everyone is in on the fun! 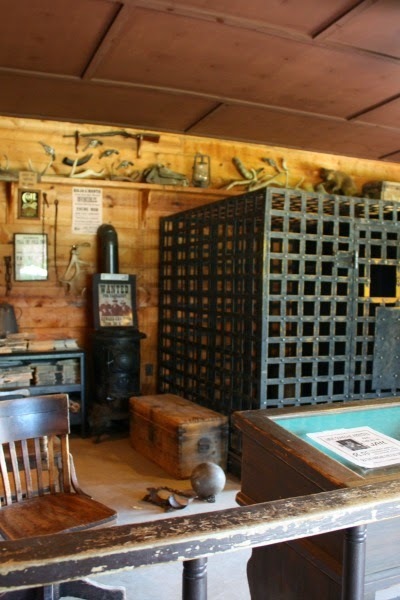 True to the Wild West, the town also has a jail and yes--you can get someone arrested! One worry I have about bringing my daughter to larger amusement parks is that the rides may make her a little nervous. 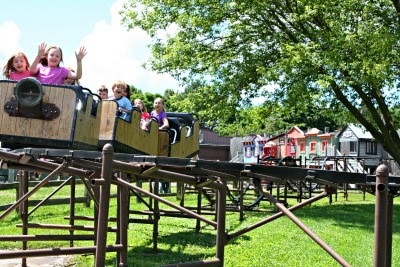 The rides at Wild West Town are kid-sized and entertaining! No worries here! Canoes on a lazy river, a carousel, a roller coaster and a train are all a lot of fun without being too intimidating for children. My daughter jumped at her chance to ride the roller coaster and giggled the whole ride. The train ride was a joy--riding through the entire park with some special surprises around the back! 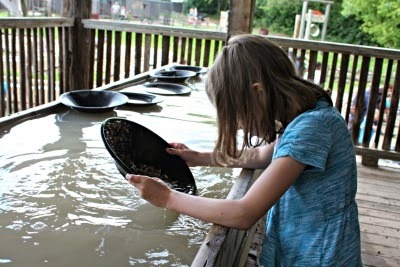 Of course, we had to try our hands at panning for "gold!" The park's mining area actually has plenty of room for families to spread out and pan for treasure. We spent quite a bit of time trying to make it rich! Just like a real prospector, we were able to pick our spots and look for iron pyrite. If our spot seemed low on the pyrite, we would set up shop at another spot. Finding pyrite was challenging and we found satisfaction in discovering our riches together as a family! What is the West without a Gunfight? We wouldn't have been in the Wild West without a good gunfight! Wild West Town has gunfights everyday and I have to say they are pretty entertaining! The kids were really involved in the show and that makes for quite an amusing experience. The gunfight can get a little loud and a couple of kids did have difficulty with the noise. However, the stadium is set up in a way you can easily whisk them out. Most enjoyed the show and did not have a problem! In all of the excitement, it may be easy to skip right over the Museum. Please don't! There is a section that models an old street and gives you a real peek into businesses from days gone by. 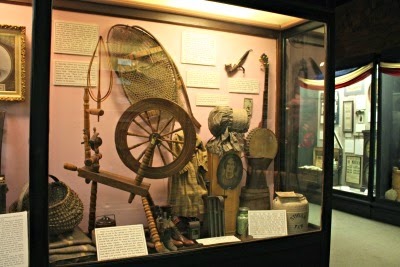 The other wing of the Museum as an impressive array of artifacts--artifacts from the Old West, pioneers, the Civil War and more! 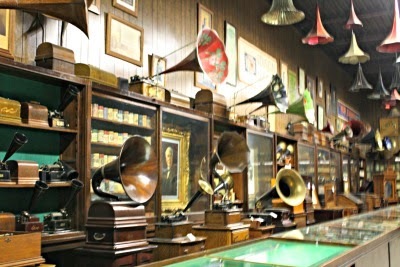 The Museum also has a world famous phonograph collection. I can guarantee that you probably have not seen so many phonographs in one location before and in such phenomenal condition! Amazing! Wild West Town does have some treats for the family. There is an ice cream parlor where you can get an ice cream sundae and some light snacks. You can also enjoy some fudge and other sweet confections at the General Store. 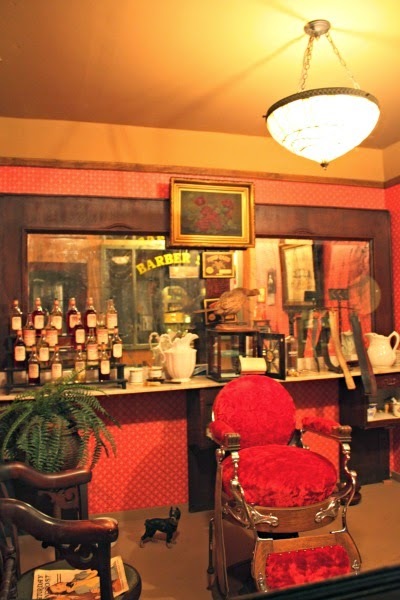 The Saloon is the perfect place to whet your whistle with sarsaparilla and root beer. 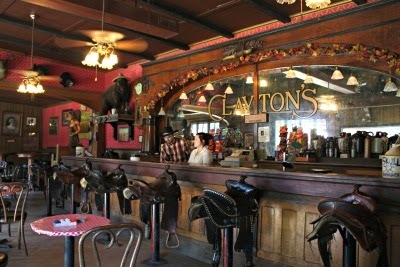 The Saloon was one of my favorite parts of the park. From the saloon doors to the saddles at the bar to the bar games at the tables, a stop at the saloon for a drink and a game or two is a great Wild West experience. The South Union Roadhouse right next to the park is a great place to pick up lunch or dinner. The menu is fairly large with many family favorites. A nice place to pick up some grub! Donley's Wild West Town is located at 8512 South Union Rd in Union, Illinois. Tickets are $16 per person. You will receive a punch card for attractions. All rides and attractions are included and you can use your punches for whatever attraction you would like. There are 3 Wild West Shows daily--at 12PM, 2PM and 4:30PM. 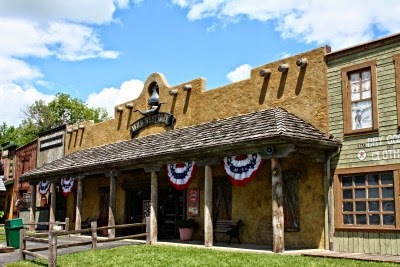 Wild West Town is opened daily 10AM-6PM through August 23. August 24-October 26 the park is open weekends only 10AM-6PM. The Fall Festival is September 27-October 26. We had a wonderful afternoon at Wild West Town! For parents with younger children, the park is less daunting than large amusement parks. Plus, the old school activities open up memorable bonding experiences for kids and their parents or grandparents. Kids 11 and under will have fun at Wild West Town with the park being particularly exciting for those 5-9. We had a splendid day with family memories that will stay with us! My family would really enjoy this place, and the prices seem quite reasonable for all that you get to do!